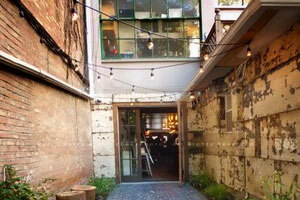 The graffiti bar is in incredibly popular outdoor bar in Philadelphia with a unique style. As the name says graffiti covers the tables and the whole area. Overstated is the word because they have a variety of furniture that is full of color, life and energy. It’s a very different take on the more conventional settings that many bars have and something you may want to use with your own decorating. The main demographic that this style appeals to is youth. College age kids who have just met the drinking age and are out to party in a big way. Pieces that look like they are ready to party are very important to them, at least in the back of their minds. 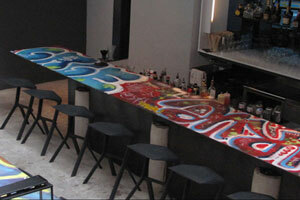 That is why the Sampan Graffiti bar is covered in what else, colorful graffiti across their chairs and walls. Wherever you look the place is a feast for the sense. Another important aspect is that their outdoor furniture is not the only part that inflames the senses. From the drink selection to the overall atmosphere everything is lively and pumped up for the crowd. You can’t look in a direction without seeing someone having a good time. In the back of the minds of people this all feeds into the good time and convinces them that they’re having an even better time than they previously thought. What is equally amazing is that they can also use their indoor furniture outside because they have a clear enclosure up above that lets the full sunlight in while protecting them from the elements. This is something that very few places have but it’s an amazing example of our modern technology at work. If you have enough money to create a similar atmosphere it could be amazing. Unfortunately it’s beyond the reach of most homeowners but could be something that a restaurant owner wants to invest in over time. Heat lamps and candles accentuate the heated, lively atmosphere that the bar usually plays host to. When things get too hot they turn on some nearby air conditioning that works well with the enclosed top. You could learn a lesson there by using the exact same things for your own setting. Perhaps an equally interesting aspect of this is that it is on the back of the Sampan restaurant so you can get their classy and delicious dishes from the same kitchen. They are one entity after all with one side catering to those with top shelf tastes who want to pay a premium for gourmet food, and the other side having a constant party that people can enjoy on their off days. These contrasting styles also complement each other and keep the clientele from getting bored with one side or the other. So the main thing to take from this is to not be afraid to go crazy and over the top. It can work if your outdoor setting has that same lively atmosphere for those that you care about. It’s up to you how to decorate it. 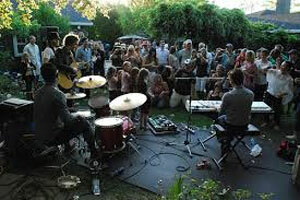 Music is an important part of most parties in this modern age. Outdoor furniture that works with music is important. Everything from having a large enough area for whatever music you have to setting up your colors to a theme are both extremely important. Size is always a consideration with music. Both the size of your pieces and of the area as well. If you have a table it needs to be large enough to fit whatever stereo, turntable or other device you are using. There are of course smaller things like the iPod boosters that some people use. A large table in a side area is the most popular choice for things like this. That is because you want a focal point that is on the side so that it doesn’t get in the way of people dancing and enjoying themselves. It is no accident that so many clubs use this model. Setting this up for an outdoor furniture space offers a special set of benefits and challenges. First you usually have to consider acoustics because you are likely not going to have an enclosed area that the sound can reverberate in. The sound is going to be launching one way, hitting the guests, then trailing off into the neighborhood. You also don’t want to have a noise complaint so you have to plan this carefully. You can use some larger pieces to catch some of the sound if you put them parallel to the source of the music. That can help reflect it some over time. The type of music your people will be listening to also matters quite a bit. Do they like loud, raucous rock or rap songs for a lively party? Make sure that they have the space for it and you may even want to get a live band or DJ. You may even want some sort of stage if you go all out. Others may prefer as subdued party with light music and easy listening. A simple stereo would suffice here, perhaps with an additional table for food and drinks. People love to snack while talking. The cost for these various pieces of outdoor furniture varies widely. You may spend a huge amount on a DJ area or a small one on a few casual tables. Just be sure to make a checklist of what you need when you are shopping in order to make sure everything comes out correctly. For those who really want to go the extra mile you could always theme your pieces for a group of musical artists. Of course you may be crossing the line into tacky at that point but it is a thought. Regardless of what you decide make sure to get feedback from your guests on everything from the décor to the music. None of this deep thought on the subject matters unless it works for them. People can be too nice though so try to find an honest opinion somewhere that you can take into account. 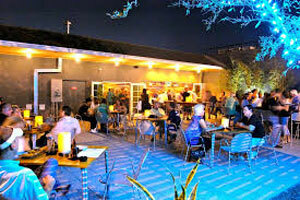 When looking at the outdoor bar furniture style New York is one of the best places that you could possibly examine. With some incredibly stylish locations that rank in along the best in the world there is a lot to be learned from this. So hopefully we will learn something from all this in just a bit. Mostly we’re going to bring you practical examples and point out what you can learn from them all around. It should be an enlightening experience. First let us take a look at the Battery Harris. They combine an incredible selection of wines and beers with some unique furniture. You can even buy off of their jerk menu, which we assume both serves jerked items and is for jerks. There is no rhyme or reason behind the décor of this one. They have palm trees with lounge chairs a few feet away from wood burning stoves. It is perhaps the fact that their outdoor restaurant furniture is so scattered that gives it a charm. It’s hard to make something like that work for everyone but it can if your pieces are truly interesting. What is perhaps most thrilling is that they theme the food and drink specials to the weather and décor. Something truly amazing that some of us should try. The Hot Bird is literally a former auto body shop turned into a bar with some amazing beers. They have a large first pit in the middle of a vast patio which is always a favorite for any outdoor furniture enthusiast. Fire pits are extremely useful for social settings and they used theirs to the best effect. Suitable for adults only though, you don’t want a child wandering too close to one. But adults need their places too, of course. Their outside lounge furniture is also amazing. The Cannibal has a very interesting name that denotes some meat eating all around. What stands out about it is the jungle setting that they have their outdoor furniture under. The pieces are literally put under a leaf canopy with vines all around you. It’s like you’re really having a fine dining experience within the jungle and is amazing in its own right. What should you learn from that? If possible surround your setting completely with nature. It can lead to some additional maintenance that you have to do down the line but that doesn’t really matter with the sheer amount of style you will be adding with it. The Boat Basin is a beach themed setting with sand everywhere and at tiki lounge. You can enjoy the views because it also happens to be near an amazing skyline. This just goes to show that you can create a really cool theme even if you aren’t near an area like the beach. You could do the same yourself if you decide to import quite a few materials to your own outdoor setting. These lessons are especially important for restaurateurs. You need to stand out yourself to make it in the industry today and those are a few ways to do so. Outdoor snow bars have many lessons on furniture that they can teach us. From views on shelter to unexpected pieces that fit well anyway there are a huge amount of things to learn all around. Today we’re going to go over these and give you a few lessons of your own to check out. You may even find it useful for your own designs. One major thing with these is that bizarre outdoor furniture is absolutely essential all around. This means you can have a bar but also a hot tub nearby. This is a favorite of many bars. You want a way to warm up after having cooled down and the reverse is also true. This is why you see so many refreshing pools near bars in hot areas. Things that are opposites in design can be symmetrical and create an absolutely amazing combination all around. 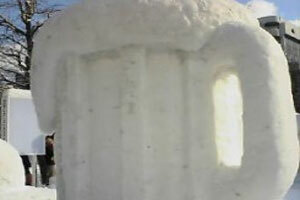 So how would you go about designing your outdoor snow bar? First you need a way to keep it cool. You can always go with the traditional fridge even in the snow but you might go for a cool and environmentally friendly solution. There are containers that can let in the cold from outside that can help keep your drinks cool all the time. A wooden or metal container can easily let it in. There is however a danger to that if things are too cold in your area. Due to the absolutely massive alcohol content it doesn’t freeze properly but keeps getting colder and colder. If you are cooling it down from the ambient air then it could get ridiculously cold. There have, unfortunately, been quite a few deaths from this in Russia in particular. Be sure that you test temperatures before actually sitting down to enjoy drinks sitting on your outdoor bar stools. This is an important consideration for restaurant patio furniture. So that’s the first part. You will need durable stools themselves or a somewhat enclosed overhang like you would find at a ski lodge as well. Many of these combine the two to create an absolutely excellent setup for your outdoor furniture. There are many ways to do this from overhangs to an outdoor heated tent. Many bars of this type like to use tents because they are durable, easy to setup and quite warm with proper heating devices. Another lesson it teaches us is to buy outdoor furniture for the elements. This may mean that you are in an extremely hot place that needs seats which can withstand the burn. Or it may be cold, snowy and moist like in the previous examples. Make sure not to buy any that absorb the elements too much or it could really cause some serious problems for you all around. This advice also works well for the occasional extreme weather. You could throw a snow party for that unexpected storm, as long as everyone lives nearby. It’s up to you to decorate your bar the way that you want to and stock it properly. Choose the style that suits you. What are beer gardens? In the modern day it could mean any number of things from a massive garden to a small one on the side of a restaurant. They are however extremely popular and you can create your own with a singular style of outdoor bar furniture. The definition of a “beer garden” is very simple. 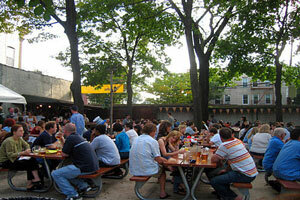 It was originally a German tradition that spread out all over the world and was called “Biergarten” in German. These places were favorite hangouts during Oktoberfest and other celebrations where you would, what else, consume quite a bit of beer and eat some food. In the modern day their function has changed very little. They usually have a beer hall, pub or restaurant on the side that ferries drinks and dishes out to them. Perhaps usually isn’t the right word as we cannot think of one that does not have any of those. Today this tradition has stretched all across the world. We have them here in the United States where beautiful horticulture matches excellent food. They also have sturdy outdoor furniture to match this level of quality as well. All of these are important parts of the atmosphere. In Japan they have their own signature styles of smaller plants and exquisitely crafted door work. In Japan where urban sprawl is a host problems and host/hostess clubs dominate the streets they are located on rooftops. This is really cool because they can combine the plants with a view. So what lessons can you learn from them? There are quite a few. The first one is to have some nice serving outdoor furniture. This could be a long table with a bench or a buffet that you place the food on. It’s rare to find a human being who doesn’t want to have a party at some point. You might need any of these pieces of outside restaurant furniture. Proximity of your outdoor furniture to a serving area is great as well. If you can create an outdoor kitchen then that is even better. That is something which can really impress everyone. Of course just having something to get food from nearby is important. Your glassware can also add to the ambiance of any personal beer garden. Depending on the style you want you may choose to have massive steins that people can get copious amounts of beverages from. Or you may go with some simple wine glasses for sipping high quality fare over time. You would of course go with a rustic or high fashion style depending on which you were going for. Do not forget to add your own work with plants. Having shrubbery, trees and much more are all important parts of any garden. This one is no different from any of the other ones in that regard of course. The final touch is of course the food and beer, which is beyond the scope of our blog. We’re going to leave it up to you to find out what your friends and family want from that. We’re sure they will tell you.